The following is the third message that we received in the Yucatan this past December. You can find our other messages on our website at www.alunajoy.com under the "Articles for Personal and Planetary Transformation" link. It might be a good idea to read them in order as each message builds upon the previous one. We are sharing this message here with you just as we received it, in present time, with very little editing. We do this for a very important reason. We know the messages that we receive are not just for our groups, but are for others as well. The Star Elders assure me that the message and the corresponding energy will be transmitted to you. So as you read this, you might want to imagine that you are with us. Also, always view the photos on the website that we share, as photos also hold some energy of the sites. Message received while inside Kabah's main arch way / main doorway into the site. The Star Elders were waiting for us. I invite you now to tune into the energy that is flowing through this gateway. It can feel like a good, but woozy, feeling. The Star Elders are trying to show me something that is pretty subtle. It has to do with the culmination of all of our hearts with the next energies that we will receive here and in the next few sites. We are collectively going to activate these sites. This service is beyond the ego. So it is not something that we will plan with our heads. It is something that will happen because of our heart presence and focus. Our presence is needed (This goes for all of you out there reading this now!). The Star Elders are sharing this act of collective service in the most un-egotistical way possible. Any words that I use are going to sound like we are special, and they don't mean it in this way at all. Remember the other day when they said that The Star Elders were going to explode the light of the sun in our hearts? That activation is essential to this dimensional doorway right now. Our hearts exploding with the light of the sun is a crucial and vital part of the opening or widening the doorways between dimensions that will bring the shift about the ages. We help open this doorway by our presence of our egoless heart. It is activated by the beauty that our group holds (and all groups that are reading this message). We hold the beauty of creation. We are also absorbing this energy that is flooding through this doorway, and this will help us adapt to the new energy of the new world that is coming. It also opens up a doorway inside of us; As above, so below; As without, so within. Because the doorways in the physical world are opening, the doorways within us have to open as well. The physical and the spiritual are merging and all (the body and the spirit) will be taken to the new world. Okay . . . now you might feel a little tightness way in the back of your neck, like right here . . . (Aluna points to just below her top of the spine area . . . just below the C5 vertebrae. C5 is the big bulge at the top of your spine). Many of our group said "Yes, yes." Also, just now you might feel a little queasiness in the stomach? Anther symptom when we step into a lot of energy is that you might feel a little short of breath. The Star Elders are linking a sacred cross right within us (for those reading this, visualize a vertical line running up your spine, and the horizontal line running across the top of your shoulders). At the center of this cross, the dimensions are joining together. This is where the dimensions link up in our physical bodies (just below C5). Remember we are not dropping our bodies during this shift; we are taking them. Our spirits have made this journey a few times now over the eons . . . but not our bodies. This is the physical work that needs to be done; to join the spirit with the body in a multidimensional way. Over the past few weeks, you may have been feeling some issues with your skeletal structure. This is part of our physical bodies getting ready to make the leap. This center of the cross is our new multi-directional GPS. You might feel a throbbing kind of feeling, like a small little pain, but it feels good. So, as we stand in this doorway, in some quite concentrated energy, our intent, the beauty of our group (and those reading this) and the light of the sun bursting in our hearts is adding to this energy. It is waking up the dimensional doorway outside of us here, and inside of us as well. It is the spiritual heart chi inside of our body. Everyone in this is giving back to this site, and when you give, you receive. And when you receive, you give. It is a symbiotic relationship between you and the site. It is like an infinity symbol. The Star Elders are very pleased that we are here. It is this area of the Maya lands that the Star Elders were calling us back to. During the next 2 days, we will be visiting places that the Star Elders really felt we needed to be at. Each one of you were called to be here (and to those who read this as well). There are no accidents. There are no mistakes. Everyone is here for a reason. The collective energy of this group (and of those who read this as well) has been brought together for a reason. 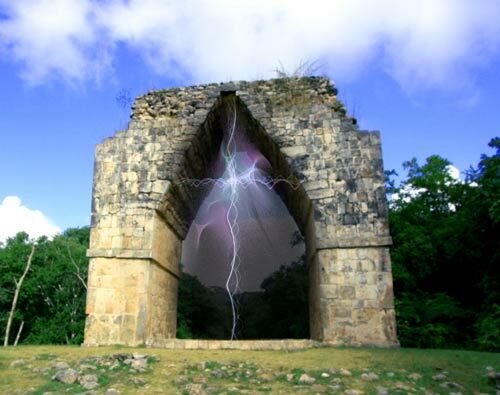 Now, the Star Elders are showing me that our energy is filling up the energy in the stones and the arch all the way around. This energy has opened the Sacbe (road of light) to this site. It is magnifying the energy that we carry, the energy that we hold, and the energy that we brought with us. The arch is turning gold. It is just beautiful. So we are getting a homeopathic inoculation of this site today that will affect us in a very core level. The Star Elders are telling us "Welcome." They are welcoming us and thanking us for being here at this important time, and they are sending us gratitude for your presence and courage. There is a lot of energy here today, and we are starting to adapt now. Have you noticed just now that your physical symptoms have already become better? The dizzying kind of breathlessness is better, and our necks are not feeling as tight. We have integrated very quickly. The Star Elder say that this activation changes everything in our lives now. Everything. Our orientation point is different. We are going to see life differently from this point on; Our perspectives and our outlooks will change. We are going to find that things that we were holding onto are going to be easy to let go of now. New and better things will come in to fill those places. Archangel Michael is saying to be easy on yourself and to give yourself a break. You are still human. If you remember, a few months back in the middle of 2011, no one could feel their path. Now a new path has been provided. Things will be clearer. Some of the clarity we may not like at first; but once we surrender to it, we will find that many more doors will open. The Star Elders say that this is day one. It is ground zero. This is where it all begins in us as we walk forward with our inner sacred cross activated. Archangel Michael just popped in, and he says "You are going to spread a beautiful virus across the planet that everyone hopes to catch." (laughter) There will be many who will fight this shift. They are attached. Our peace and our comfortableness with the shifting energy will help other people feel more comfortable. We will feel less shaken by what is shifting. It will be a comfort and bring ease to all of those around us. We will do this from our hearts . . . by just walking through a grocery store, the post office, or sitting in a movie theatre. People will automatically feel a little bit calmer, because we are carrying that pivotal, new, orientation point inside of us that gives us a little more grounding in the new energies. It doesn't mean that we are not going to struggle with little bits and pieces of this shift, but we are going to integrate it a lot quicker. If you have noticed, we are already doing this. Things are shifting quicker inside of us now. Instead of taking months or days, it is taking hours or minutes to shift through things. Our service to the world is anchoring and just staying in that new center point . . . that pivotal point, new orientation point. We are of service to the planet just by BE-ing who we are. The Star Elders again are sending gratefulness. They are so pleased and grateful that we have had the courage to fall into this body with all the limitations and the restrictions of 3D and be of service in this way. They say that it took great courage for us to allow ourselves to be in human form. This is a round-about way to say that the Star Elders are big chickens (laughter), because they are not here are they? I am always teasing them about this. They have a great sense of humor, so this is not disrespectful in any way. It is not their time to return just yet. The energy they carry is very strong and very pure, and it magnifies everything that is out of balance with cosmic law. They are getting us used to this energy. We are on the planet. The planet is moving. The planet is ascending. If you are in a body, you are going to get initiated into this energy. There is no way out of it. Some people are checking out. Some people are committed to staying. I know that everyone in this group is here for the big party. So they are filling our hearts will gratefulness and respect for us, because they want each and every one of us to not feel small or significant, because when we look in the mirror, we think we are that. But if we see ourselves the way they see us, there would be no room, no hacienda, or any bus that could hold us. Do you get what I am saying? We are huge. And again . . . they are saying this in a very egoless way, but they also want us to acknowledge the light and the power that we have within us in a very, humble, grounded way. And they love us so much (and a heartfelt blessing and love to those reading this). We were allowed to make a Sacred Site Essence in this site. It is called "Kabah ~ Activating the Sacred Cross". This essence can be found on our web site. This essence aligns our inner sacred cross with the emerging new world and help us be in service to the world in a stronger and more harmonious way.